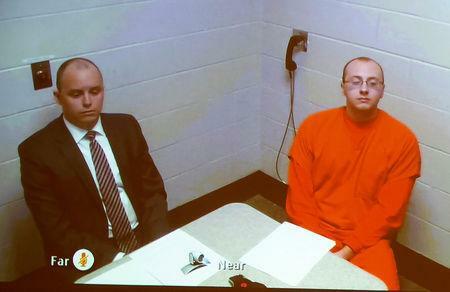 (Reuters) - A Wisconsin man charged with kidnapping 13-year-old Jayme Closs and killing her parents has confessed to his crimes in a letter written from jail, saying "I can't believe I did this," a local TV news station reported on Friday. Jake Patterson, 21, wrote to a reporter at KARE 11 News that he had acted "mostly on impulse" but does not "think like a serial killer," according to a copy of the Feb. 28 letter published by the Minneapolis-based television station. Patterson was charged in February with murder for the Oct. 15 shooting deaths of Closs' parents in Barron, Wisconsin, and for kidnapping the girl he is alleged to have targeted seemingly at random after spotting her boarding a school bus. He is accused of holding her hostage until she escaped on Jan. 10. KARE 11 News said the letter from the Polk County jail was sent to one of its reporters who wrote to Patterson asking him whether he had any remorse or regret for the crimes. "Huge amounts," Patterson replied, according to the letter. "I can't believe I did this." In the letter, Patterson also said he planned to plead guilty to the charges against him because he does not want Closs' family to "worry about a trial." Police say Patterson has admitted to dragging Closs into the trunk of his car and driving to his cabin in Gordon, Wisconsin, about 110 miles (177 km) northeast of Minneapolis, where he held her hostage for months, sometimes under his bed. After escaping, Closs sought help from a woman walking her dog, according to court papers. Soon after, police arrested Patterson, who told investigators he had been looking for Closs. In the letter, Patterson said he had planned to confess when he was caught because he did not want police to interview Closs and "hurt her more for no reason." Patterson is charged with two counts of first-degree murder for the killings of James and Denise Closs, as well as kidnapping and burglary counts. If convicted, he could face a sentence of life in prison. A lawyer for Patterson, Charles Glynn, could not be reached for immediate comment on the letter published by KARE 11 News. The news station reported that Glynn could not confirm or deny the authenticity of the letter.